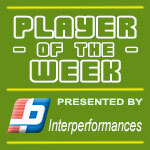 Center Torey Fassett (198-C) had a very impressive game in the last round for Flyers and receives a Interperformances Player of the Week award for round 10. He had a double-double of 39 points and 10 rebounds, while his team beat Rebels (#10, 1-10) 85-76. Flyers maintains the 3rd position in Antiguan league. They would have been even better if they hadn't lost a few games earlier this season. Flyers will need more victories to improve their 8-3 record. In the team's last game Fassett had a remarkable 64.3% from 2-point range and got three three-pointers out of 7 attempts. He turned to be Flyers' top player in his first season with the team. Torey Fassett averages this season 27.0ppg and 9.8rpg. 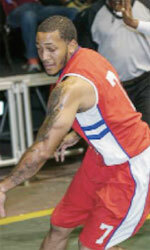 Second best performed player last round was Roger Hood (196-F-96) of Baldwin Braves. He is American forward in his first season at Baldwin Braves. In the last game Hood recorded impressive double-double of 28 points and 14 rebounds. Of course he led Baldwin Braves to another comfortable win outscoring the lower-ranked HS Outlaws (#9, 2-10) 92-72. Baldwin Braves' 4th position in the standings has not changed. His team's 6-4 record is not bad at all. Hood is one of the most experienced players at Baldwin Braves and has a reputation of one of team's most reliable players. Former Kalamazoo College star Hood is a former Eurobasket Summer League player, which is considered top international summer league in the market. Third place about best performers goes to forward Benny Iko (201-F) of league's second-best Potters S.. Iko showcased his all-around game by recording 29 points, eleven rebounds (!!!) and four assists in the last round. 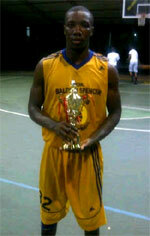 He was a key player of Potters S., leading his team to a 84-68 easy win against the lower-ranked Freetown T. (#8, 2-6). Many experts and fans count Potters S. as a contender for championship title. Another victory and another confirmation that they may be right. Just look at their record: 9 victories and only one lost game. Iko has a very solid season. In 9 games in Antigua he scored 15.1ppg. He also has 11.1rpg, 3.6apg, 2.1spg, 1.7bpg and and 3PT: 45.2%.